Bullimore's - Corby Locksmith - 24 hour Emergency Locksmith Corby. Bullimore’s; Your local Emergency Locksmith in Corby is ready 24/7 to help. Whether you are locked out, need locks fitting, repairing, lost or broken keys, require duplicate keys cutting, or maybe upgrade your current locks to British Standard BS3621 locks, that are anti-snap, anti-pick and anti-bump type locks we can help! We also provide free security advice, to give you the customer the correct locks that will give you total confidence and security in your home or workplace. 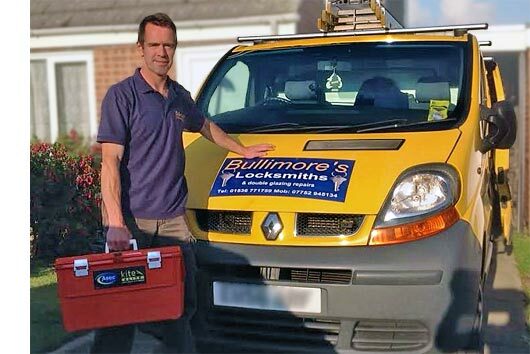 Bullimore’s Corby Locksmith is a local Locksmith company based in Gretton, Northamptonshire. We always provide a friendly, professional level of service, with Police checked staff, punctuality, and fully guaranteed work! With our unmatched customer satisfaction, you can be confident that we are the best available! Our phone is on 24 hours a day, 7 days a week to come to the rescue! Part of our service is to carry out UPVC window and door adjustments and repairs, and have a vast stock of all types of UPVC door and window lock systems. We strive to provide the solution to your problem! Garage door locks and handles are also stocked on our mobile workshop to suit most common brands! Top quality locksmith workmanship without mess! Corby Locksmith also carry out UPVC window and door repairs and adjustments!